Welcome to my first ever review of a mod battle – and for that matter, to my knowledge, the first ever mod battle! This battle features gegy1000 and FiskFille, two fairly successful modders with a decent repertoire of content (though FiskFille arguably has a better reputation). The rules are simple: each creator must make a mod with the theme of “mob fusion”, and the community must vote to decide who is best! To begin with, I will review each mod individually, then compare them at the end. Hold your judgment until you’ve seen both in their entirety, please! This mixture of a bat and pig is fairly weak. It is not hostile, nor will it attack if provoked. Interestingly, this creature can be ridden if equipped with a saddle! Combining a skeleton and a spider gives you the skeleton of a spider! Or rather, a spider that looks like it is made of bone. This creature is identical to a normal spider except for its appearance and increased health. It also may creep you out by making skeleton noises. Okay, not really Spiderman, but a villager mixed with a spider. This is kind of terrifying. Spider villagers, despite their scary appearance, will not attack you; instead they will climb walls and hop around, but also trade with you if an attempt is made. This sheep-thing is still adorable. Mixing a slime and sheep together will yield a transparent green harmless creature that can be shorn for slimeballs. Perfect for making those leads and sticky pistons – too bad this mod isn’t for 1.8! Fusing those adorable giant cat-things and a witch will create a mob of impressive destructive power. Ghasts are generally considered balanced due to their size (easy to hit), but these tiny witches boast the same giant fireball attack. Good luck! It’s a good thing that mobs must be spawned manually, or these terrors would cause untold chaos throughout your world. 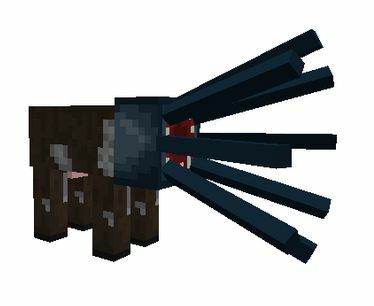 With a mind-boggling total of 30 HP, these mobs are near impossible to destroy safely. 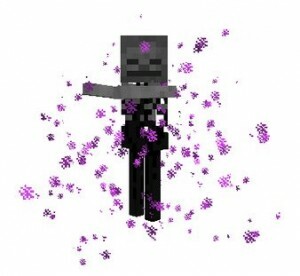 They will explode just like a creeper when they are near ANY mob or player, with a completely random explosion radius. You could lose a block or half your town. Spawns a zombie when it dies. Exactly as the name implies, this is a mix between a cow and a squid. As you might have guessed, this is one of the mobs that do not spawn naturally – it must be created with a spawning egg. This is actually a mount and companion; it will befriend the player and drown its enemies. Milking it yields calamari stew. Not very creative names, I know. Nonetheless, this is a fairly terrifying creation. It explodes like any normal creeper, but with a few catches. First, yes – it can climb. You are not safe on top of your houses any longer. Second, this mob will actually latch on to your head. The only hope from that point on is to get far away from any valuable blocks. While dangerous, it isn’t especially difficult to kill (3-4 strikes from any decent sword). Fisk is really great at thinking up the scariest possible combinations. Skeletons are annoying enough, but what about one that can teleport at will? This amalgamation also deals melee damage if the player gets too close. At 30 health and the annoying dodging properties of Enderman, this is a force to be reckoned with. This boss mob is… Well, I’m not sure what it is. It is some ambiguous mix of various parts – let’s leave it at that. If you ever come across one of these, it honestly may be better to run for your life. With 10 armor, 250 health, 10-20 hearts of damage per attack, the ability to jump high in the sky, and all three modes of attack (melee, ranged, and spells), the Morbid Harvester will almost definitely morbidly harvest you. It will attack any mob on sight. Now that the mobs are done, let us move on to the items. Yes – FiskFille includes items, some of which are almost necessary to defeat the boss mob. These items look like black leather and are dropped from Ender Skeletons. 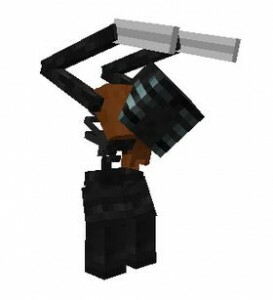 They can be crafted with two iron ingots to create reinforced Ender scales. This is the ultimate weapon. It is a guaranteed drop from the Morbid Harvester and deals 40 damage per strike. I have yet to verify if it can be enchanted (not even close to ready to take on the Morbid Harvester!) but if it can, the boss mob drops loads of experience points to take advantage of. So, which mod is better? Of course this is a matter of opinion for everyone, but allow me to give you mine: hands down, no contest, the better mod (currently) is Mystical Creatures. Sorry, gegy; allow me to explain. First off, Fisk has simply incorporated the mod into the game more naturally. It is entirely playable in survival, with controllable and uncontrollable elements. Plus, the mobs yield rewards for the effort of finding and slaying (or interacting with) them. 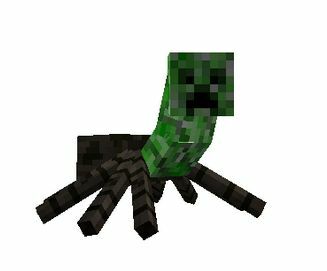 Honestly, I do like gegy’s mod for the ability to interact with the mobs – trading with the spider villagers and riding the flying pig, for example. Fisk however has an epic mountable cowsquid, which trumps both of these. Next, I enjoy Fisk’s mob designs more. 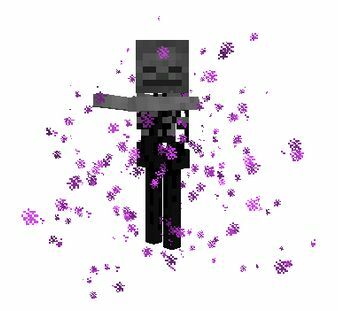 I know this is a matter of opinion, but gegy mostly just retextured old mobs while Fisk mixed them together as the battle theme suggested. Additionally, the inclusion of a completely new mob was a great choice. Another point for Fisk is from the inclusion of item drops and recipes. As I said, the player is rewarded for finding/defeating mobs: calamari stew (a rideable mob that damages enemies AND provides food? Awesome! ), the ultimate armor, and a creepy yet powerful weapon. I do have some concerns over the destructive capabilities of the Morbid Harvester, though. Finally, I actually have one point against Fisk for my last observation. 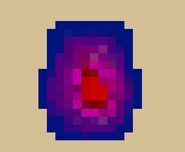 The Infusion Stone in gegy’s mod is on the path to a really interesting mechanic allowing players to mutate mobs into unique combinations, making them a more active part of the process. This could eventually evolve (see what I did there?) into a truly deep and interactive mod. Fisk, on the other hand, simply gives spawning eggs and a rare chance to find mobs in the wilderness who seemingly mutated on their own through some freak accident. Still interesting, but again, it removes the player from the actual fusion. In the end, I vote for Mystical Creatures as the best mod in their current states, but think Mob Fusion has some serious potential to become one of the greatest mods in history with enough time and effort. *UPDATE* FiskFille has informed me (as you will see in the comments) that mobs can be fused manually by bringing them close together. Even more reason to love Mystical Creatures! Download the latest version of MobFusion and/or Mystical Creatures. Drag and drop the .zip file(s) downloaded in step 2 into this folder. Now that you know about each mod, which one do you think deserves to win this battle? Give them both a download, try them out, and go vote here before the battle is over! Leave your vote in the comments section below as well. Additionally, let me know in your comment if you enjoy these long-format battle breakdowns! I really enjoyed reading this! It’s well-written and made me laugh at a few points (especially from the morbid harvester pun 😉 ). However, I do need to add one thing; in Mystical Creatures, you actually can manually fuse the mobs, although I might not have made it clear enough in my post. You only have to move them close enough together, and they will fuse. Also, I have made it official that a Mod Battle #2 will be happening. Any suggestions as to who I should challenge next? Also, I have made it official that a Mod Battle #2 will be happening. Do you have any suggestions as to who I should challenge next? I’m not around the PMC forums a lot so if you do another battle you should definitely drop me a message here! I’d love to cover it.